What can be said about the Cate Great! Show that isn’t in the name? Cate blends high-end circus with unique comedy. You will be charmed by her wit and astounded by her skill. Whether she is precariously balanced on her rolla bolla or defying gravity balanced on her hands you will be thrilled and amazed (don’t know what a rolla bolla is? Come down to the show, you will not be disappointed). 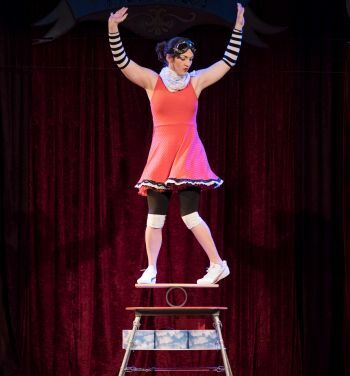 Trained at The Quebec Circus School, Cate is a seventeen-year veteran of circus stage and street. She’s performed in eleven different countries including: Australia, New Zealand, the United Kingdom, and Dubai as well as most of the United States and Canada. She’s charming, she’s talented–she’s not just great, she’s Cate Great!